I am very excited about this project today. A little MFTeaser for you all, using the New Release (tonight) called Ride Em’ Cowgirl. I have to say when I saw this set, I thought it was just adorable. When I got to actually PLAY with it, I totally fell in love with it. It was very QUICK and simple project. You know I’m all about that! Better yet you probably already own what I used 😀 If not-it would be worth the purchase of this container (wink)! 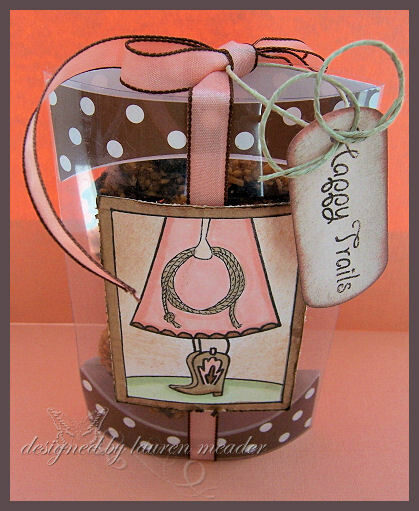 I LOVE giving cards with matching gift containers. Sometimes IMO the container is so pretty, it may not meet the expectation of what is inside. Ever feel that way? I often make my own container’s and bags, but sometimes the PERFECT- already made- container is waiting for you to use, and you just need to realize it. Here is proof that nothing should be thrown away! I was in my stamp room-munching away on Somoas Girl Scout cookies-and playing with this set. I went into my template drawer, where I keep all my own templates, as well as other “I can’t throw this packaging away, I may NEED it someday” item, and saw my empty Sprite’s Brown Dot Prima box. I saved mine after seeing one altered in Paper Crafts Feb 2008 edition- page 56 Hearts Treat container by Nicole Keller. In case you want another idea, go check her’s out. It was pretty genius! I was planning on making a Pillow Box-but this was even better. This would be PERFECT to put those Somoas in 😀 So I did. Since the cowgirl comes with a border, I just cut an even border around her, then colored it in. I had to distress the edges for that rustic look. I LOVE Guava, and close to cocoa for this Cowgirl set! Its so pretty without being TOO girly. 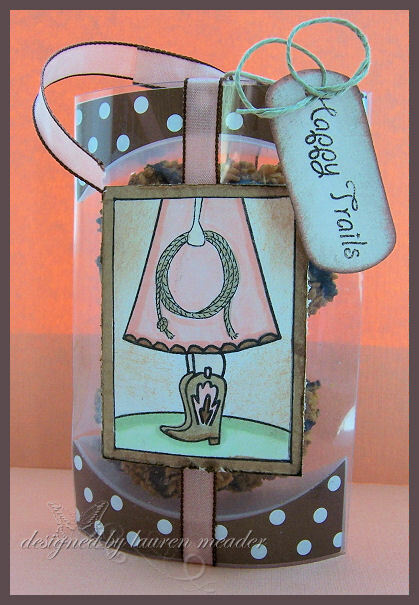 You know what mean-more rustic girly! LOL! I loved how the tag is hanging like it was Lasso’ed. Just untie the bow-and pop off the top! Now you can munch the cookies-without ruining the package. My dad ALWAYS sang that song to us, when he would leave. Too funny. It was the first thing I thought when I saw this sentiment. Maybe I should send this to him. I have not seen him in over 2 years! HMMM! 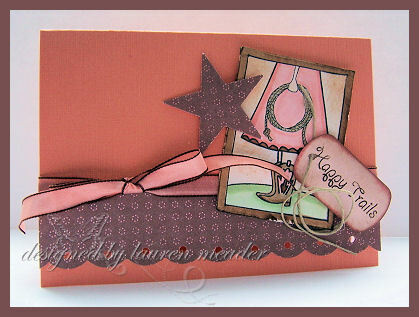 I loved using the Guava textured card-stock on this one. The Star punch by SU! ROCKS!!!! Perfect size. I wanted to continue the “dots” theme. SO I used Berry Bliss paper by SU! Its a perfect combo with this set. My ribbon is by Martha Stewart, and was PERFECT! Now the DETAILS on the MFT party! My Favorite Things (www.mftstamps.com) is having a New Release Cocktail Party on Wednesday, March 5 from 9-11 p.m (Eastern Time). THATS TONIGHT PEOPLE!! !Lots of fun is planned including finding out how YOU can be the next MFT Guest Designer. Head over to the MFT forum on www.splitcoaststampers.com to find out all the details and join us here on Wednesday night. Hope you will come chat it up with us. I will be there! I also hope you all enter to be the guest designer. If you have never entered before NOW is the time!!! Put any insecurities aside and GO FOR IT! SOMEONE has to win-why not you? You miss 100% of the chances you DON’T take!